Last December, we introduced Discover to bring you essential information from the web. This May, we added stronger signals and a new design that made it more personal for you with better stories and Tweets from people you know. Now we’re improving Discover again: when you visit the Discover tab on twitter.com, you’ll see a continuous stream of Tweets, which automatically expand to show you the most relevant stories and most engaging photos. The name of this game is context. What Twitter has been working really hard at is providing top news stories and trends, but providing the context around it so that you know what’s important. By showing you who is saying what about something, it gives you a reason to care. I am starting to use Discover more these days when I fire up my browser in the morning and throughout the day. It’s the same way I use the Explore button on Google+. These features give me a “pulse” of the network I’m on and let me see what’s up. 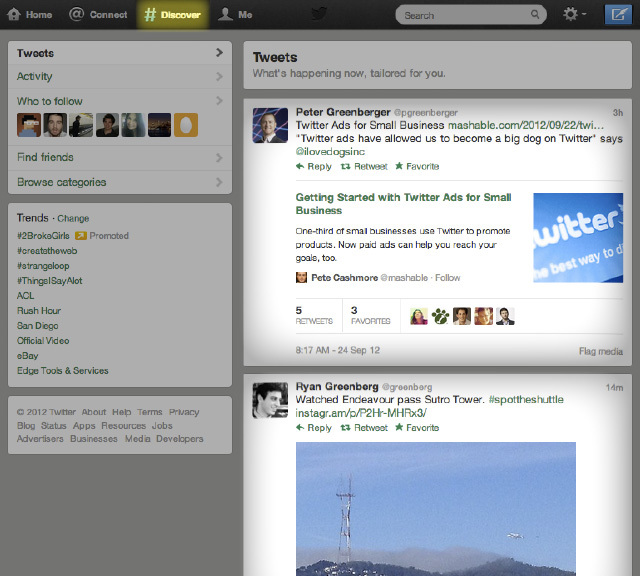 Discover on Twitter is interesting because it’s tailored to your interests based on who you follow and who they follow. While Discover is not a perfect system, I’m told by Twitter that it is working on some improvements, much like this one, and we’ll keep you updated. This should be rolling out to everyone starting today. I’m looking forward to it.